Bodas are a dangerous way to get around. That being said, I love them. I love the feeling of breezing down Lugogo on a hot day, the view of Kampala’s hills at night and the freedom you feel when navigating through a jam in record time. Bodas are an inescapable part of life in Uganda. So rather than lecture you on why you shouldn’t ride them, I’m going to tell you how to mitigate the risks as best you can, and how to deal with the more practical aspects of riding a boda, such as negotiation. First and foremost let’s get real: you absolutely should wear a helmet. Oh I know, they don’t look cool, but neither do your brains splattered across the pavement. And honestly if you think you’re too edgy for basic head trauma protection, you might want to consider your audience. 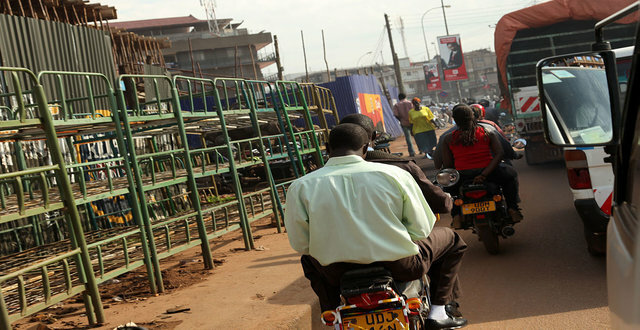 75% of all accidents in Kampala involve a boda and around 20 cases a day are admitted to Mulago Hospital. Of those with head trauma who weren’t wearing a helmet, 50% are a lost cause (meaning most doctors won’t even bother with you). While a few stores sell quality helmets here, they are also fairly easy to procure from expats on their way out, so check forums (like ours! ), and Facebook groups for your best options. If you simply cannot find one, or just hate carting it around, ride with bodas that carry extra helmets for their passengers. Drivers who work for companies such as Safe Boda and Tugende VIP offer helmets to passengers. Drivers are also tested to ensure they follow the rules of the road and adhere to safety standards. Download the Safe Boda app to find a driver near you, or head over to Tugende VIP’s website for driver profiles and phone numbers. However, another important aspect is to harness a network of trusted boda drivers. If you ride with someone who has exceptional driving skills, take their number and ask for their working hours. Be cautious when jumping on any old boda. While Kampala is fairly safe for a big city, if you pull a driver off the street, there is always the chance that something could go wrong. Unknown/non-stage bodas have been known to take their passengers to remote locations and rob or assault them. Taking a boda from a stage mitigates this risk considerably. Also remember to take a good look at your driver before heading off. Does his breath smell of gin? Are his eyes clear? Drunk drivers don’t deserve your business so do not hesitate to find another if you suspect he’s under the influence. Taking a boda you know also helps in another aspect of riding: negotiation. For those new to the city, it can be difficult to create a mental list of how much Kabalagala to Acacia Mall costs, or how much Bugolobi to Naguru is. But just know that no ride inside Kampala proper should cost you more than 6,000 UGX during the daytime. Personally, I’ve found the best way to negotiate is to barely negotiate at all. Simply get on the boda and tell them where to go. A bit of Luganda will come in very handy here as well. When you get off, hand them what you think is fair, say thank you, and walk away. This rarely fails as the boda drivers will assume you know the route, know the price, and won’t argue. If one does try to argue, or cheat you, feel free to hand them a fair amount and simply walk away from the situation. Last week one boda driver tried to charge me 7,000 UGX from Lugogo’s Game to Cayenne. When someone is being that unreasonable, don’t bother arguing. Tell them, “You can take this money or take none, but I’m walking away now” then make moves to leave. They will generally take the money and act terribly put out, but a long as it’s an honest amount, there’s no need to feel bad or argue your case. However, in my many years hopping on bodas the vast majority have been friendly, polite guys who are looking to make a bit of cash on a daily basis. Treat them with respect and they will often treat you like their most valued customer. Happy riding!